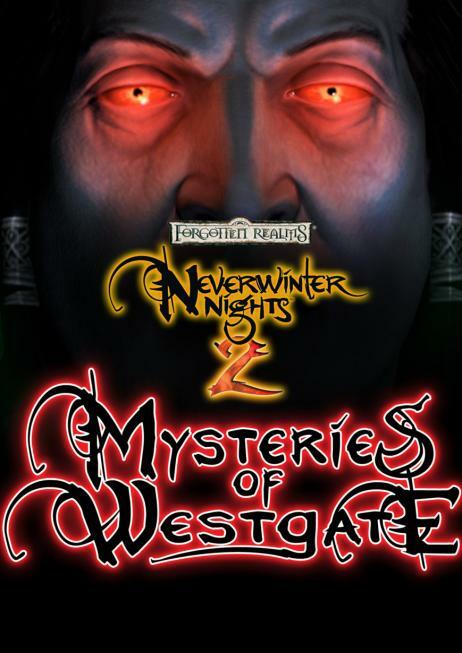 Mysteries of Westgate is the first (adventure pack) for Neverwinter Nights 2. It was written by Canada-based Ossian Studios, which might be the unluckiest computer game developer ever. They created Darkness over Daggerford as a premium module for Neverwinter Nights -- just in time for Atari to decide that Neverwinter Nights shouldn't have any more premium modules. Then they created Mysteries of Westgate -- only to have Atari sit on it for 18 months while they figured out how the DRM and European distribution should work. But now the adventure pack is finally out. Was it worth the wait? Since Mysteries of Westgate is an adventure pack rather than an expansion pack, it does not contain a lot of frills. It has a new tileset and some new music, but mostly it just includes a 15-20 hour campaign. As the campaign opens up, you learn that your character at some point in the past picked up a strange mask. The mask is cursed -- you can't get rid of it and it causes bad dreams -- and your inquiries lead you to Westgate, where, of course, many mysteries await you. Characters begin the campaign at level 8, and chances are that they'll progress to about level 14 by the end. You can choose any race and class for the campaign, including the new races and classes from Mask of the Betrayer and Storm of Zehir, but those expansion packs aren't required to play. However, and somewhat oddly, while you can add three companions to your party, you'll only find three companions total in the campaign (a rogue, a fighter, and a priest), and so some races and classes are better choices than others. I played the campaign using a fighter / rogue, and I was consistently annoyed that I didn't have an arcane caster available. The campaign structure in Mysteries of Westgate is disappointingly similar to the campaign structure of Storm of Zehir. That is, there isn't much going on with the main storyline (you don't really learn anything about the cursed mask until the very end of the game); you just need to complete a bunch of side quests on your way to the parade of final boss battles. The side quests are fun enough, and they involve vampires, pirates, spiders, and of course hamsters, but they're all short, and they only rarely have anything to do with the main storyline or your companions. They just felt like random filler to me, which is sort of sad coming from a developer who likes to mention Baldur's Gate, which linked together characters, quests and plot as well as any game ever. Also disappointing is the companions. Since there are only three of them, and you can add them all to your party, they should be intricately involved in the campaign, like the companions from Mask of the Betrayer. But they're not. Each companion gets a single side quest devoted to them, but other than that they only rarely comment on what's going on, or complain if you make a decision that goes against their alignment. And what's the idea of only including three companions, anyway? A developer needs to make at least some effort to guarantee that the companions can complement the main character to form a complete party, either by including several possible companions, or by giving the available companions different leveling options, but Ossian completely dropped the ball here, and you're given no options for how to put your party together, which is annoying. Continuing what is turning into a gloomy review of the game is the gloomy look of the game. For some reason -- probably because vampires play a non-trivial role in the proceedings -- it's always dark in Westgate, to the point where it's frequently difficult to tell what's going on. Two of my characters wore lighted rings, and my priest always had the Light spell active, and yet there were still times when a cut scene would start up, and I couldn't tell who was talking to me or what was going on. There's atmosphere, and then there's playability. Playability should always win. My least favorite kind of campaign is the collection-of-side-quests kind, which only requires the laziest of writing. I didn't like it in Storm of Zehir, and I didn't like it here. From looking at the scores of other reviewers, I see that I was in the minority about Storm of Zehir, and so perhaps others enjoy bunches of unrelated side quests more than I do, or perhaps others are just desperate for a halfway decent campaign, and they'll take whatever they can get. The thing about Mysteries of Westgate, even beyond the campaign structure, is that Ossian Studios just made all sorts of poor decisions. Besides the companions and the dark setting, the voice acting is a little iffy (the actors often read their lines instead of acting them, and only about a quarter of the lines even get voice-overs), it's almost impossible to do any enchanting (the campaign uses the original enchanting system, but it includes almost no essences), and, surprisingly, the campaign is reasonably linear (each time you complete a main quest, you open up 2-3 side quests, and so the campaign proceeds in steps). Overall, I'd say that Mysteries of Westgate is more disappointing and frustrating than it is bad. The content all works, it's reasonably well written, and it has a friendly price point ($10), so there are worse ways you could spend your time and money. If you liked Storm of Zehir, then you'll probably like Mysteries of Westgate as well. But if your preferences are like mine and lean more towards Mask of the Betrayer, then you might want to skip Mysteries of Westgate altogether.